If you read the I Saw Yous every week in the Inlander, the Blue Door Theatre has the show for you. There is a sort of running joke among Inlander staffers that goes something like this: "I love your newspaper! I read the I Saw Yous every week!" For all of our hard work compiling news and entertainment stories, a dedicated faction of our readers still pick up each new edition of the newspaper and head straight for the I Saw You/Cheers/Jeers section. That's just fine with me, because each week at the Inlander I have the pleasure of personally selecting the various submissions for that section. When the Blue Door Theatre announced its latest edition of I Saw You! improv, I was naturally excited. In a way, the show is a reflection of my work, although I wouldn't dare take ownership of the local phenomena that is the I Saw You section. It is a showcase of the best and worst that Spokane and the surrounding area has to offer. Love, death, heartbreak, politics, revenge, late-night trips to Walmart. You'll find whatever you're looking for in this section. The submissions are all vague enough that you can let your imagination do most of the work. This is probably why they make for such great improv comedy. "We see stories in everything. 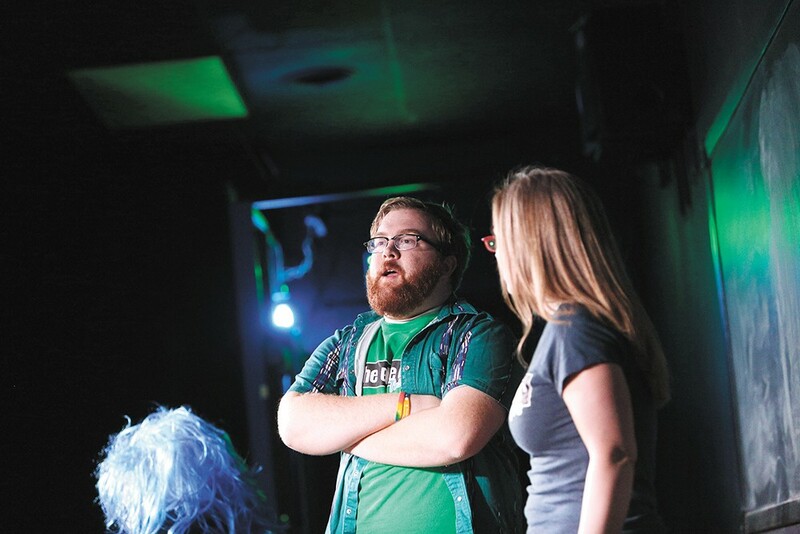 Improvisers are people watchers," says improv actor Frank Tano. "We make assumptions about things, whether or not they are true, for our own entertainment." He's been at the Blue Door Theatre for over 20 years and has been the comedy group's artistic director since 2003. The idea for the I Saw You! show, Tano says, began at a local eatery in 2009 after the troupe finished a show. Someone picked up a copy of the Inlander and went to the I Saw Yous. "Two of our folk were reading these out loud and I was like, 'Wow, there some good sources for scene work in those!'" Tano says. It works like this: Audience members cut out clips of their favorite I Saw Yous and submit them before the show starts. The clippings are taped to the wall behind the stage, but Tano and Co. don't know what they are. Each skit begins with one of the actors reading the clippings to the audience. Tano's recent favorite opens with: "Like swirling clouds of gas at the edge of the solar system, there's always something lonely about following the path designated by forces we don't quite understand." That submission wasn't exactly a missed connection, nor was it a Cheer or Jeer, but it is definitely weird, and weird works. "If I don't have 20 questions after reading an I Saw You, to me it's not a good one," Tano says. Not every skit is a winner. The Blue Door's Liz Schroeder acknowledges this when she opens the show. Not everything is going to work. Some veer way off track. Others lose what initially made the I Saw You novel or funny to begin with. But it doesn't really matter, because ultimately the show is mostly about a group of people doing goofy stuff on stage. Tano says he's still waiting for an audience member to fess up to writing one of the I Saw Yous. The original print version of this article was headlined "I Saw Blue"